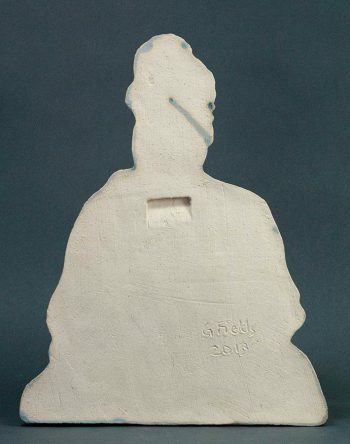 Remind yourself to slow down and touch the depths of your own higher self with this sculpture of a serene, meditating yogi. 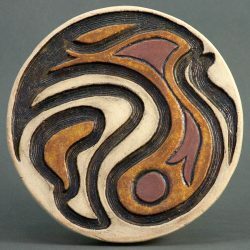 This carved relief piece features a rubbed off blueish-green glaze. 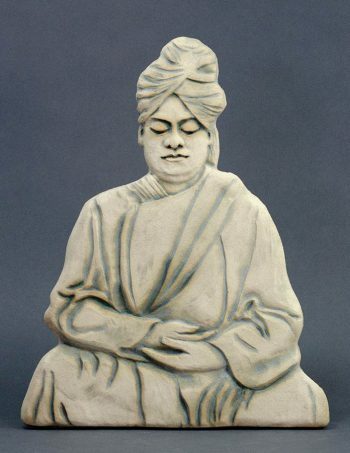 This piece is a portrait of Swami Vivekananda (1963-1902), who was the first Hindu monk to bring the Vedanta philosophy and Yoga practice to the United States. The swami came to the United States in 1893 to speak at the inaugural Parliament of the World’s Religions in Chicago. The greatest help to spiritual life is meditation (Dhyâna). In meditation we divest ourselves of all material conditions and feel our divine nature. We do not depend upon any external help in meditation. 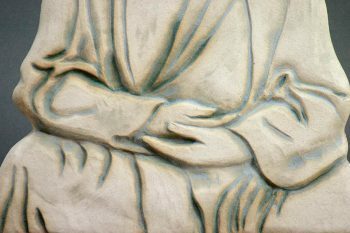 The touch of the soul can paint the brightest color even in the dingiest places; it can cast a fragrance over the vilest thing; it can make the wicked divine — and all enmity, all selfishness is effaced. The less the thought of the body, the better. For it is the body that drags us down. It is attachment, identification, which makes us miserable. That is the secret: To think that I am the spirit and not the body, and that the whole of this universe with all its relations, with all its good and all its evil, is but as a series of paintings — scenes on a canvas — of which I am the witness.